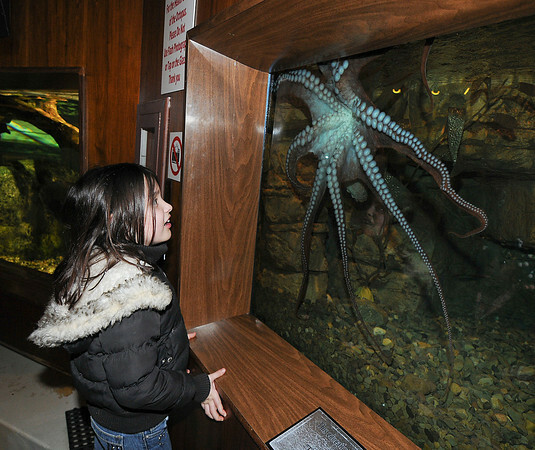 James Neiss/staff photographerNiagara Falls, NY - Cataract Elementary student Jaidyn Maines, 8, gets a good look at Twister, a Giant Pacific Octopus at the Aquarium of Niagara. Nearly 70 2nd graders from Cataract Elementary in Niagara Falls took a field trip to explore all that Niagara Falls State Park and the aquarium have to offer, some for the first time. The field trip was presented by Destination Cinema, Delaware North Companies and Niagara Falls State Park.